A favorite family destination for many years, we recently completed a $50 million redesign and are now more family-friendly than ever! 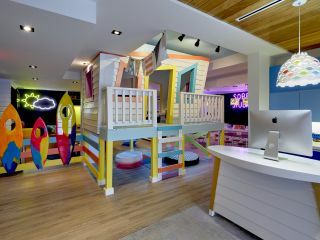 Enjoy new guestrooms, delicious sips and bites for you and your kids, an enhanced poolscape, private cabanas, and a state-of-the-art Kids Club created especially for the ultimate enjoyment of your little ones. 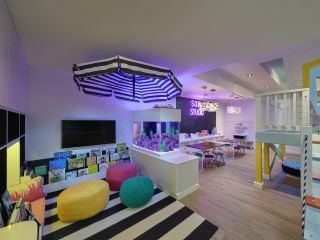 With a larger-than-life indoor lifeguard hut, areas for crafts, TV time, video games and more, fun times and adventures await your littlest traveler at our new, state-of-the-art SOBE Kids Club. We offer half and full-day programs for your kids that include action-packed outdoor adventures, scavenger hunts and treasure dives. Is your child a mini chef? If so, our guided pizza making classes are the perfect way to unleash their inner foodie. Play interactive video and arcade games in our new lounge for teens and tweens inside the lobby of the St. Mortiz Tower. Direct beach access means plenty of waves and sandcastle making in our shaded sand pit on the shore; but if sand and surf isn’t on the agenda, you and the family can splash right into our new zero-entry pool! Featuring pop fountains for poolside whimsy, your kids can bask in the South Beach sunshine or swim with noodles and floaties in our oceanfront pool. For the ultimate VIP family experience, treat yourself to a luxury SOAK Cabana, complete with air-conditioning, full bathrooms, Apple TVs with kids programming, a rooftop terrace, private cabana butler and other exclusive perks for up to six family members. Ready to feast like a kid? We love keeping kids happy with healthy and affordable dishes from the specially curated Kids Menus at each of our restaurants. 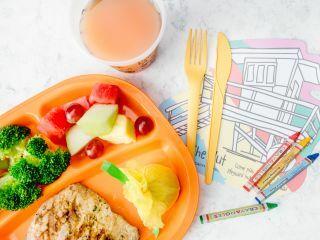 Your child can enjoy entertainment options like crayons, coloring placemats and interactive toys while waiting for their meal. You can also ask for an iPad with headphones—fully loaded with the latest age-appropriate games and movies. 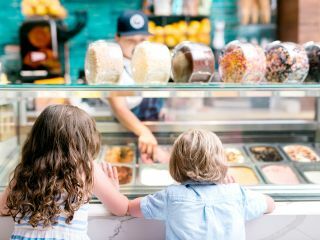 Be sure to head to Preston’s Market for a pint-size Kids Buffet Breakfast everyday or Miami Joe Coffee Co., where the family can grab a scoop (or three) of locally churned Azucar Ice Cream and purchase other toys and treats. You can even surprise your tiny tot at the end of the day with milk and cookies from our In Room Dining menu. Pampering isn’t only for parents! Your kids can enjoy spa time too, with special treatments at exhale Spa’s nail salon or Glam & Go. Enjoy happy hour fun for the whole family at Loews Miami! Parents can relax and sip on poolside drink specials at our Nautilus pool bar while kids enjoy a free hour of lawn games courtesy of SoBe Kids Club. Fri. - Sun. | 5 p.m. - 6 p.m.